A mob dragged ten men from their homes in Nokomis, Illinois for their suspected loyalty to Germany. In Missouri the charter of the German American Alliance is to be revoked. Senator King (D-Utah) is pushing for compulsory conscription. Other bills are being debated to control all food shipments. 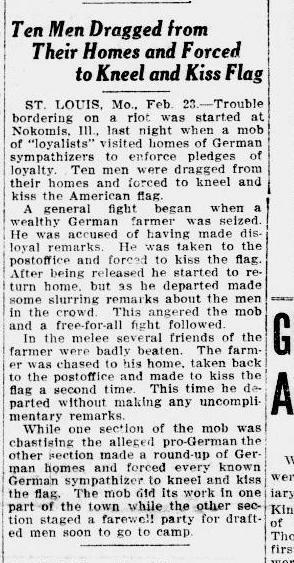 Source: "Ten Men Dragged frm their Homes and Force to Kneel and Kiss the Flag," Richmond Palladium and Sun Telegram, Richmond, Indiana, February 24, 1918. Page 1, Column 2.